3-Herbert John Walker was born on 2 Feb 1877 in Westbury, Tasmania, died on 12 Nov 1919 at age 42, and was buried in Nov 1919 in Bluff Cemetery, Devonport, Tasmania. 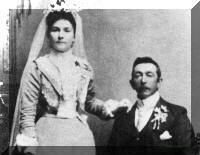 Herbert married Minnie Elizabeth Cox, daughter of Joseph Cox and Agnes Wilson, on 21 May 1902 in Parkham, Deloraine. Minnie was born on 27 Mar 1880 in Parkham, Deloraine and died on 27 Mar 1962 in Dandenong, Victoria at age 82. Herbert spent his early years farming and he share farmed around Exton. He was an active member of the Methodist church and choir. He married Minnie Cox and they left Exton in 1905. Herbert worked at Mole Creek logging with bullock team. Around 1908 they moved to Pardoe where Herb worked in a cheese factory for Mr. Room. They moved to Spreyton and Herb and a co-partner Joseph Green planted out some of the first orchards in the Mersey Valley. The family took an active part in the Baptist church, also Aberdeen Methodist church. Music played a great part in Herbert's life. They had a family of three girls and a boy. Herbert died of bubonic flu on 12th November, 1919, Minnie died 27th March, 1962. There is one surviving child, Mavis Wilson. 4-Myra Louise Walker was born on 24 Feb 1904 in Exton, Tasmania and died on 22 Jun 1976 at age 72. Myra married Albert Joseph Whitely. Albert was born on 16 Jul 1905. They had four children: Brian Albert, Elizabeth Ruth, Nancy Winifred and Rex Herbert. 5-Brian Albert Whitely was born on 10 Sep 1932. Brian married Alison Joyce Prior. Alison was born on 17 Jun 1931. They had three children: Stephen John, Robert James and Philip John. 6-Stephen John Whitely was born on 26 Sep 1962. 6-Robert James Whitely was born on 25 Sep 1968. 6-Philip John Whitely was born on 5 Aug 1971. 5-Elizabeth Ruth Whitely was born on 4 Jan 1934 and died in Aug 1967 at age 33. 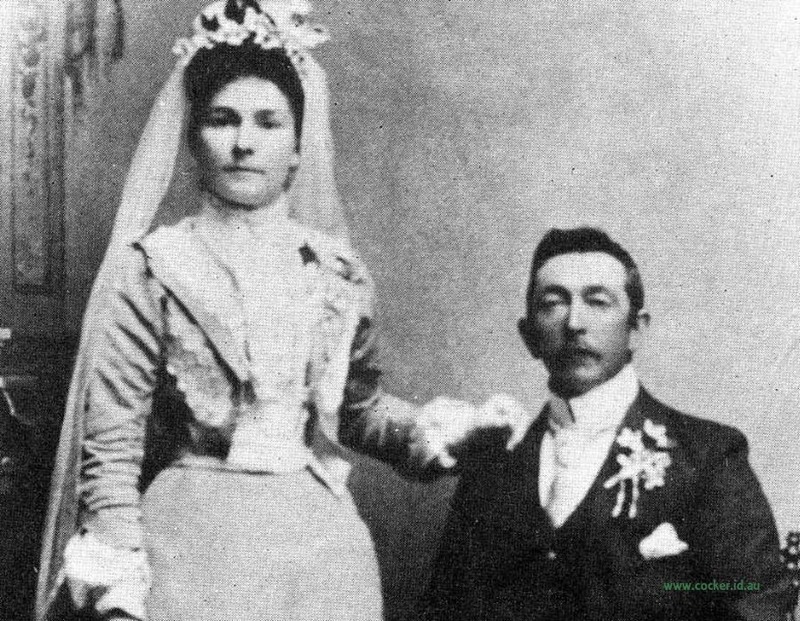 Elizabeth married Alan James Brownlie. 5-Nancy Winifred Whitely was born on 4 Jan 1934. Nancy married Alan William Porter. Alan was born on 16 Aug 1929. They had four children: Mark Jonathan, Grant Anthony, Lisa Janine and Catherine Elizabeth. 6-Grant Anthony Porter was born on 31 Jul 1965. 6-Lisa Janine Porter was born on 24 May 1967. 6-Catherine Elizabeth Porter was born on 4 Jul 1969. 5-Rex Herbert Whitely was born on 17 Jun 1942. Rex married Lorraine Nancy Taylor. Lorraine was born on 14 Nov 1943. They had three children: David Rex, John Graham and Karen Louise. 6-David Rex Whitely was born on 25 Jul 1966. 6-John Graham Whitely was born on 12 Mar 1970. 6-Karen Louise Whitely was born on 12 Mar 1970. 4-Winifred Agnes Walker was born on 2 Mar 1905 in Exton, Tasmania and died on 24 Sep 1929 at age 24. She was buriued inthe Latrobe Cemetery. 4-Frederick Herbert Walker was born on 27 May 1910 in Pardoe and died on 29 Jan 1970 at age 59. Frederick married Annie Mavis Stella Robinson. Annie was born in 1920 and died in Feb 1976 at age 56. They had two children: John Raymond and Lynette Joy. 5-John Raymond Walker was born on 2 Feb 1946 and died in Mar 1967 at age 21. 5-Lynette Joy Walker was born on 7 Mar 1949. Lynette married Peter Frederick Troy. They had one son: Dean John. 6-Dean John Troy was born on 27 Oct 1969. 4-Mavis Daphne Walker was born on 21 Feb 1919 in Spreyton. Mavis married Douglas James Wilson, son of Alexander Wilson and Margaret Lynd. Douglas was born on 30 Mar 1918 in West Devonport, Tasmania. They had four children: Winifred Margaret, Kay Elizabeth, Maralyn June and Joy Annette. 5-Winifred Margaret Wilson was born on 12 Apr 1942. Winifred married David Hugh Linton. David was born on 3 Mar 1936. They had four children: Leanne Elizabeth Jane, Janet Mavis, Karen Joy and James Douglas. 6-Leanne Elizabeth Jane Linton was born on 3 Aug 1962. Leanne married Allan Smith. They had one son: Joshua. 7-Joshua Smith was born on 10 Sep 1982. 6-Janet Mavis Linton was born on 27 Feb 1964. Janet married Brett Parsons. They had one son: Trevor. 7-Trevor Parsons was born on 18 Apr 1987. 6-Karen Joy Linton was born on 27 May 1967. 6-James Douglas Linton was born on 11 Nov 1971. 5-Kay Elizabeth Wilson was born on 5 Jul 1945. Kay married Edward Johns. Edward was born on 9 Apr 1944. They had one son: Shane William. 6-Shane William Johns was born on 30 Jul 1968. Kay next married Raymond Gaffney. Raymond was born on 14 Oct 1944. 5-Maralyn June Wilson was born on 20 Jun 1951. Maralyn married Graeme Baker. Graeme was born on 6 Oct 1941. They had one daughter: Catherine Louise. 6-Catherine Louise Baker was born on 16 Mar 1982. 5-Joy Annette Wilson was born on 20 Jan 1952. Joy married Maxwell William Cripps. Maxwell was born on 3 Jan 1938.